In my last section on Seattle, it seems I was a little hard on the old Emerald City. I may have made one or two references to the fact it occasionally rains a lot in Seattle. Okay, I ranted and joked and whined about it almost nonstop, but you have to understand where this was coming from, right at the end of about eight straight months of the wettest, cloudiest, coolest winters and springs and early summers in recent memory. So at the time it felt fully justified. Now it’s September and we’ve been enjoying the second longest stretch of days without measurable rainfall in history for this region – forty-eight days, to be precise. 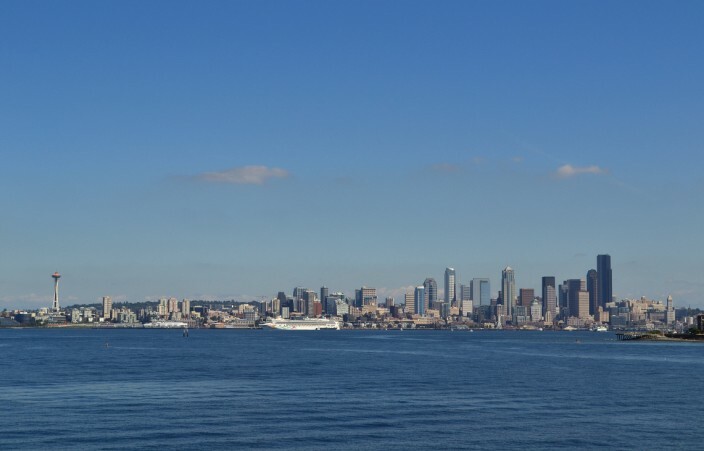 So in fairness, I decided to revisit the image of Seattle as Rain City USA and show the other side, that side which does show up from time to time, when the sun actually shines and reminds us all why we live around here and put up with so much crappy weather, because when you finally do hit a span of beautiful summer sunshine, it’s pretty darn near perfect. 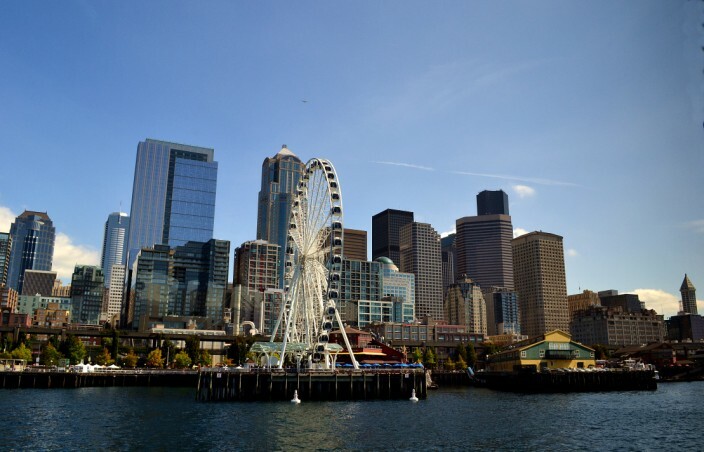 One of the attractive things about the Seattle region and western Washington in general is the abundance of water, and whether you’re looking for salt water or fresh, there’s plenty of both. All that rainfall has to go somewhere and a lot of it ends up cascading down from the mountains in the form of rivers, streams and creeks and pooling itself into big lakes, small lakes, ponds, puddles, reservoirs…well, you get the idea. 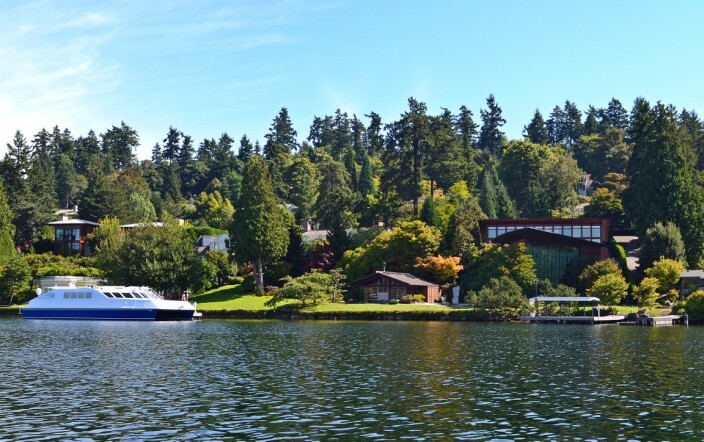 One of the glories of Seattle is Lake Washington, which forms the eastern border of the city. 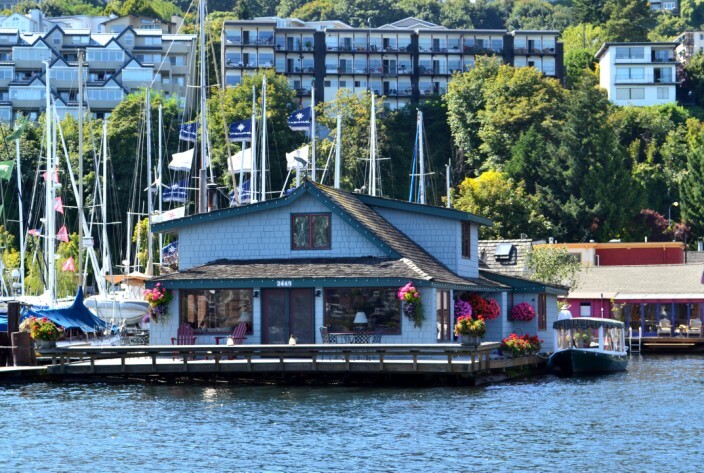 Lake Washington features many marinas, parks, bike and foot paths, and literally miles and miles of scenic shoreline. It’s the second largest natural lake in the state, running 22 miles from Kenmore at the north end to Renton in the south, with a surface area of 33.8 square miles. The waters of Lake Washington are amazingly clear and pristine for bordering a major city – okay, maybe I wouldn’t scoop it straight into a cup and drink it, but after some pollution problems back in the sixties were corrected, it’s gotten increasingly better. 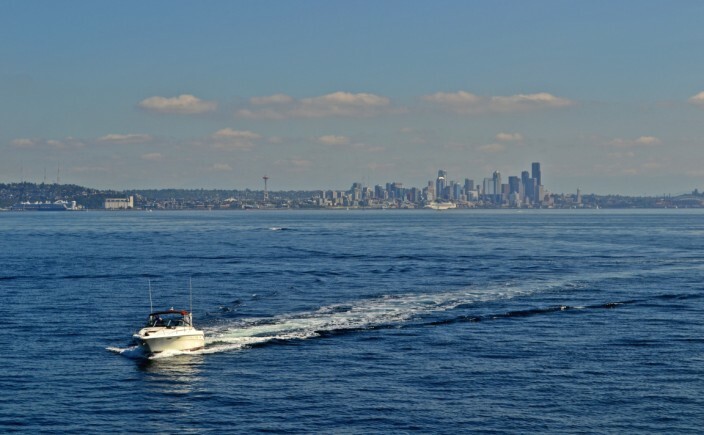 It’s been said that Seattleites own more pleasure boats per capita than any other U.S. city. In attempting to verify this, I found conflicting data but one thing is certain. You can hardly walk anywhere near the water without a marina smacking you in the face. It seems just about every resident of the city has a dinghy, a fishing skiff, a rowboat, a kayak, a canoe, a ski boat, a sailboat, a yacht or something that floats on the water in some fashion. On any given day you can see an endless parade of them out there paddling their paddle boards, jumping their jet skis, manuevering their mega yachts and towing skiers and tubers in frantic circles. 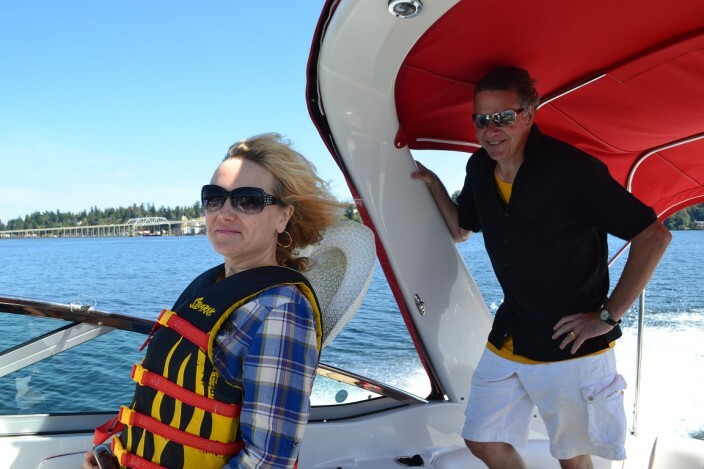 And yet one of the great things about Lake Washington is that even with this veritable armada of boat owners, the lake is so big that it never feels crowded. Well, almost never. 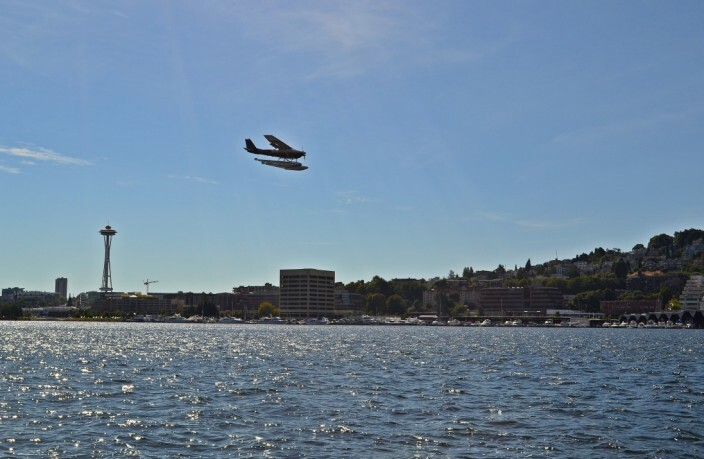 During the annual Seafair events in early August it can get pretty jammed up, especially down near Seward Park and the Stan Sayres pits in the week building up to and including the famous hydroplane races. At this point you can either join the hordes of drunken sailors crowding the waters, or stay ashore and wait for saner days. 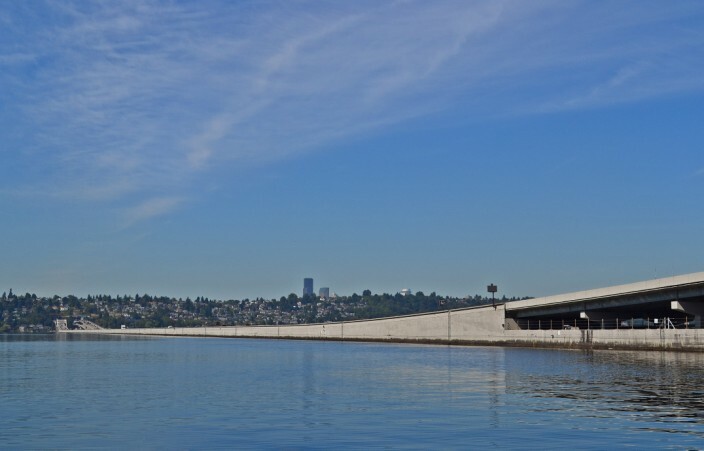 A unique feature of the lake is its traversal from east to west by three concrete floating bridges linking Seattle to the east side of the lake. 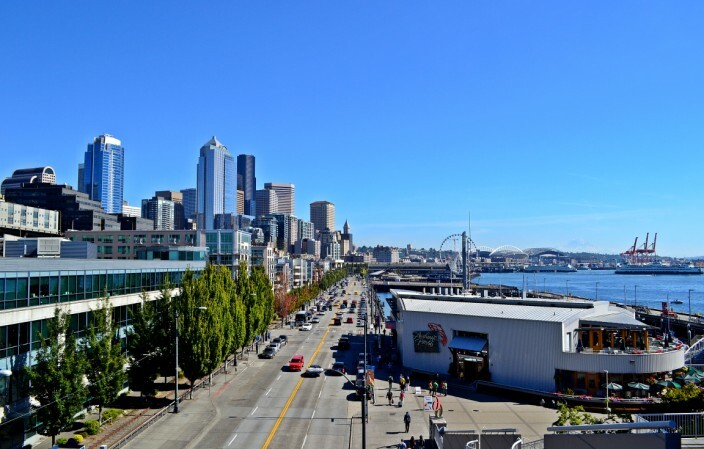 Two of them connect Interstate 90 to Mercer Island (a haven of the rich and super-rich which is situated smack in the middle of the lake) while the third bridge lies a couple of miles further north and terminates in the city of Bellevue. The concept seems a bit disconcerting at first glance – floating concrete? – but it works just fine in practice, with each of the bridges carrying thousands of commuters back and forth every day, often at the pace of a crippled slug. These three comprise the longest, second longest and fifth longest floating bridges in the world. So lets say you live in the area and want to spend a day on the water, but you don’t own a boat. What do you do? No worries, just call up your cousin who does own a boat and convince him of what a great idea it would be to spend the day cruising the waves with you and your wife for company. Problem solved. It always pays to know the right people, especially when they’re generous enough to share their toys with you. I got to do this recently and can highly recommend it. 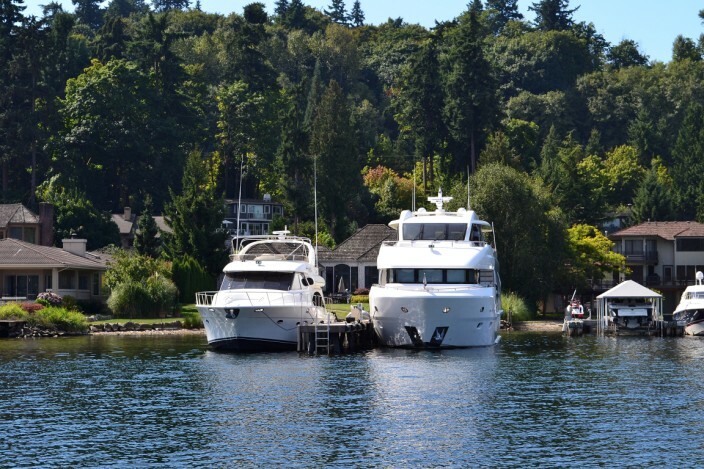 Although we didn’t really plan it this way, our day afloat turned into an informal Lake Washington shoreline tour of the Lifestyles (and homes) of the Rich and Famous, Seattle style. 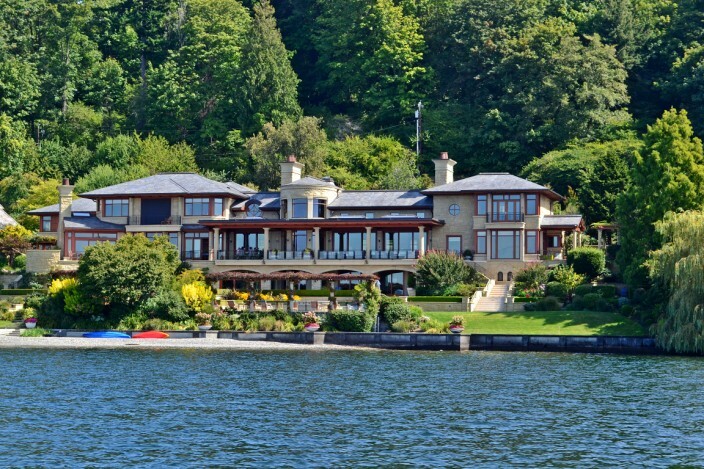 Yes, Virginia, we really did see Bill Gates house, or what little can actually be seen from the water. Eighty percent of the place is underground, and of the twenty percent above ground, not much of that is actually visible. Most of it is obscured by strategically placed trees, shrubs and other flora. Hope he’s paying his designers and landscapers well, they’ve done a fine job insuring his privacy remains intact. The other multi-billionaire’s digs on view are those of Paul Allen, another Microsoft founder and now owner of the NFL Seattle Seahawks and NBA Portland Trailblazers. 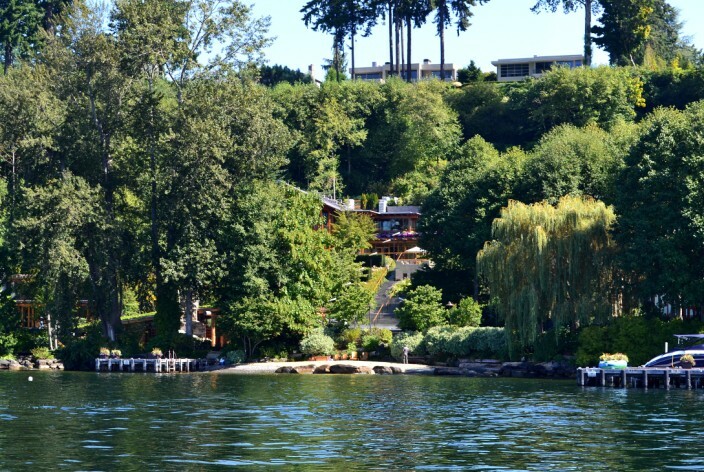 Allen’s home is located on Mercer Island. One of its more notable features is the floating heli-pad moored dockside. Seems he wanted to take off and land at home by helicopter but that idea was nixed by the Mercer Island powers that be. No air traffic allowed on the island. Solved that problem with the floating heli-pad since it’s technically not on the island. And you thought these things only happened in James Bond movies. 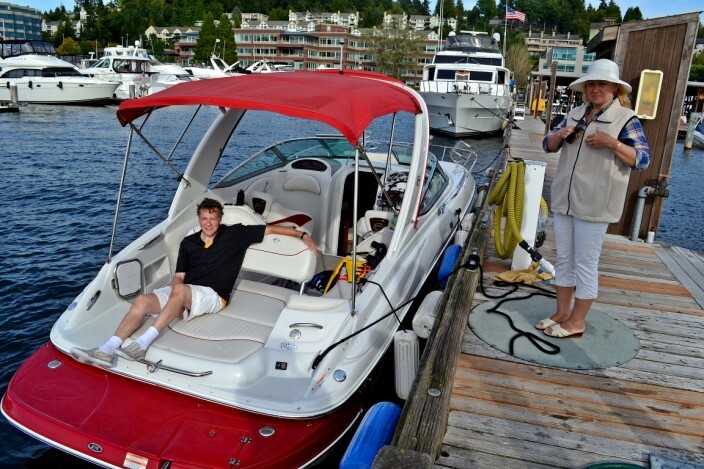 We started our tour of the lake on the eastside at Newport Marina, which is in the south end of Bellevue. 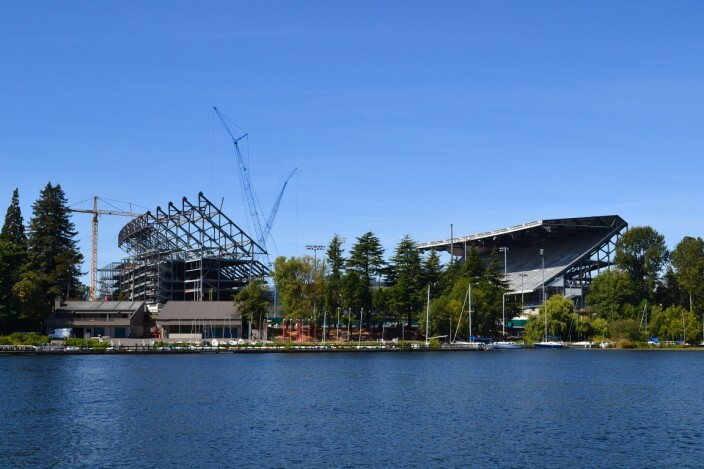 Heading south on the lake the first thing you notice is the Seattle Seahawks indoor training headquarters, which from the outside looks like nothing more or less than a gigantic metallic barn plopped on the lakeshore. Even though football is an outdoor sport played in all kinds of inclement weather, I guess it makes sense of a sort to have an indoor training facility, what with all that liquid sunshine we get around here. Hey, I can’t explain it, really. They’re football players. What do expect from a bunch of guys with brain injuries? Next up is the old Renton Boeing plant, once the busiest jetmaking complex in the world. But nowadays it lies mostly silent as they’ve moved the bulk of the jet-building to other locations. There’s still an operational airport, though, and also the nearby mouth of the Cedar River, one of the two fresh water inlets for Lake Washington (the other being the Sammamish River in the north end). The Cedar is also home to an annual sockeye salmon migration which used to feature thousands of fish coming home to spawn. In recent years the supply of fish has become more variable and is closely monitored by the state wildlife agency. Some years there are enough fish to have a short sport fishing season in the lake, sometimes not. Passing Renton, next up is the Rainier Beach area, a neighborhood I was once lucky enough to call home, and even luckier to have that home be right on the water. Over the water, in fact, as the house was built on pilings extending some 30 or 40 feet out from shore. Needless to say, it was a popular summertime hangout for my teenage friends and the scene of more than a few parties, none of which ever got out of control or featured underage drinking or illegal substances of any sort. Hey, I have to say that in case my Mom reads this. 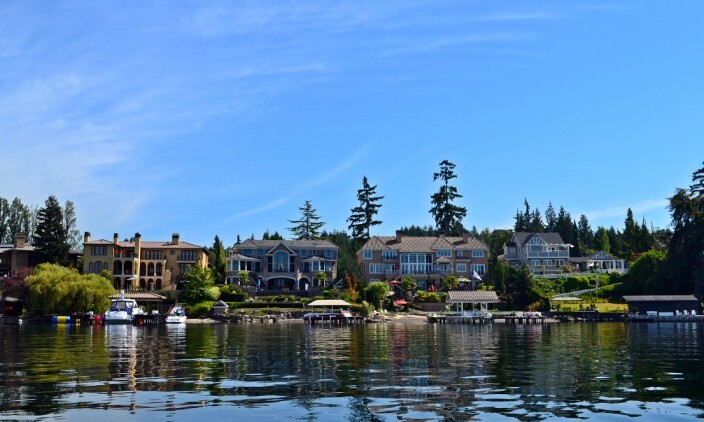 Our lake tour continued north toward Seward Park, a large tree-covered peninsula that juts out into the lake, then headed across the water to ogle the super mansions of the western shore of Mercer Island. 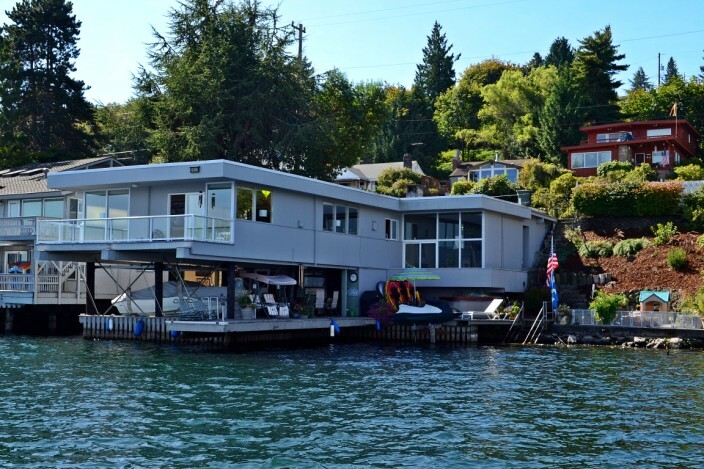 This is where you’ll find Paul Allen’s shack, nestled among hundreds of others, all seeming to compete with one another in the sort of one-upmanship that only endless bags of money can buy. We putted along the shores for some time, snapping off so many shots that if my camera had been a gun the barrel would have been on fire. 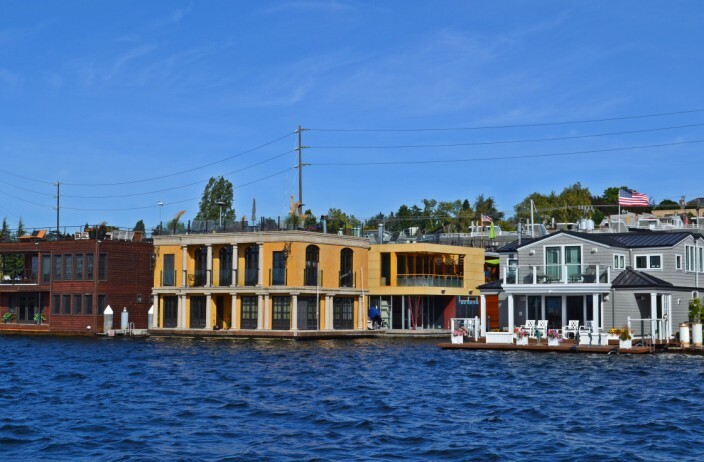 We passed under the I-90 floating bridge and sped off east toward Bellevue, ogling still more mega-mansions and palaces in Meydenbauer Bay and Medina, then headed across toward the University District and the Montlake Cut, a man-made ship canal connecting Lake Washington to Lake Union. Here is the scene of many a famous college crew race and lots of colorful graffiti along the concrete walls of the Cut, courtesy of the various crew teams throughout the years. The lake also hosts a spectacular fireworks extravaganza every 4th of July, fired off from a barge towed into the middle of the lake just for the occasion. A couple hundred thousand people cram into Gas Works Park and every concievable viewing spot along the shore to watch the big blast. It’s crowded, and the traffic afterward is horrendous, but they do put on a tremendous show. But on the day we were cruising, the only fireworks were endless sunshine and blue sky and temperatures in the 70’s. 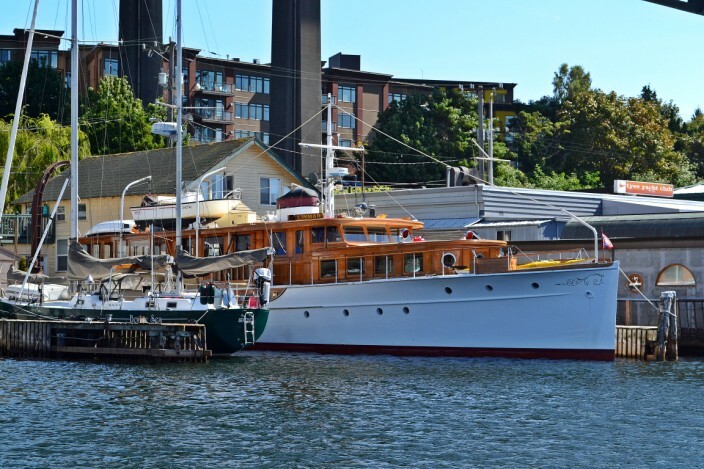 We lazed around Lake Union for a while staring at still more ginormous yachts. One of them belonged to the Boeing company, a trifling little vessel that you can fill the gas tank onboard for a mere 24,000 bucks. I guess you have to entertain those shieks and billionaires in the proper style if they’re placing billion dollar orders for your superjets. 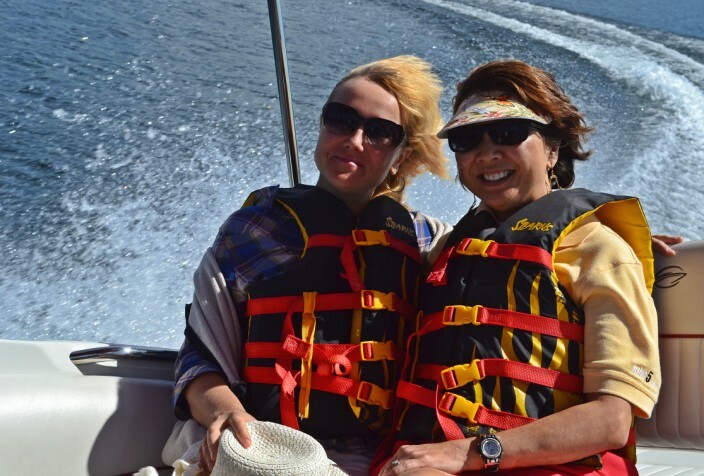 We refueled our boat (for considerably less than 24K), then chugged out to the middle of the lake, cut the motor and drifted as we relaxed and ate lunch. That’s about as close to perfect as a day off can get. 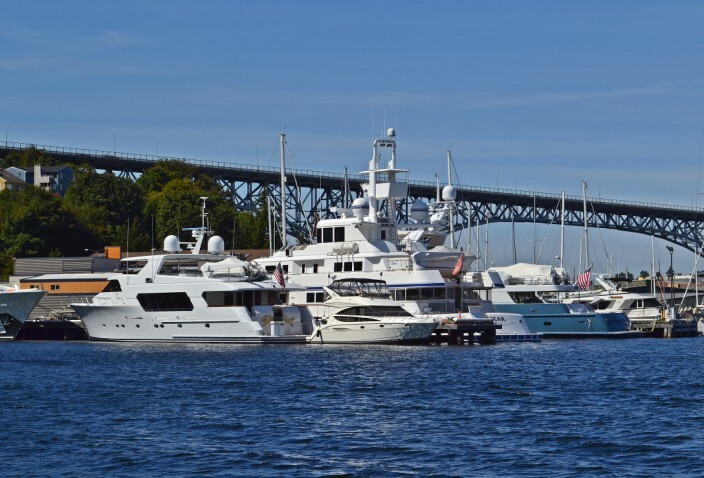 From this point in Lake Union you could continue west through the Hiram Chittenden Locks and out into Puget Sound and salt water, but we decided to save that trip for another day. 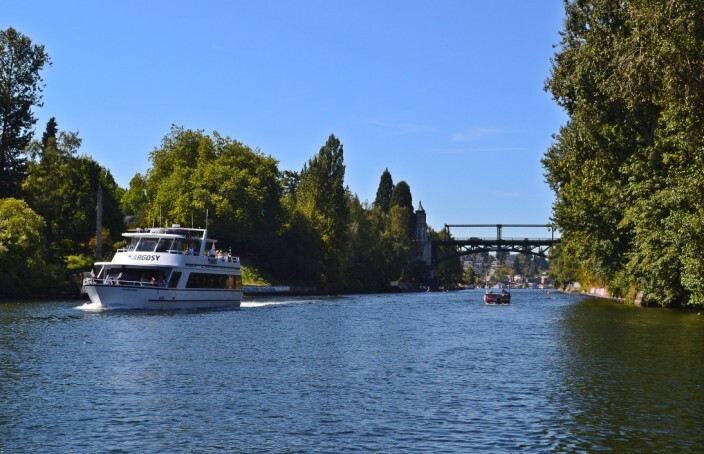 Instead, we retraced our route back through the Montlake Cut and returned to Lake Washington for still more cruising. We made it across to Kirkland, then decided to call it a day and headed back to Newport. After helping to dock the boat (I helped by staying out of the way) we disembarked, thanked my cousin the skipper, and called it a very good day. 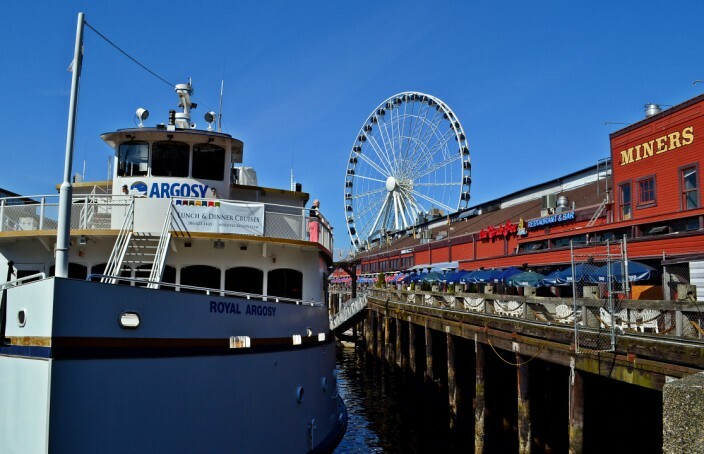 If it’s the more traditional Seattle waterfront you’re interested in seeing, we recently had the opportunity to do this as well, courtesy of a two hour harbor cruise and lunch, which was provided through the largesse of my sister as a birthday present. Have I mentioned my very generous family? Well, let me do it again. 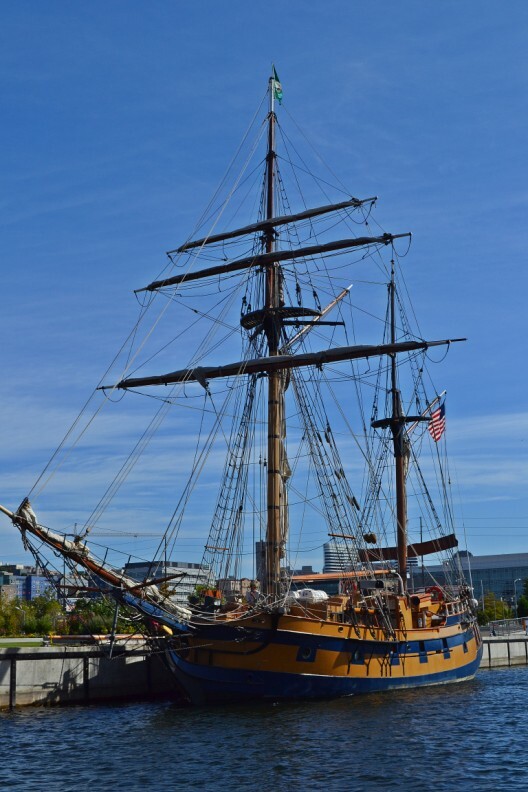 After trolling for twenty minutes trying to find a free parking place (a constant problem downtown, but that’s another story) we finally ended up paying, walked half a mile and got on board our ship at Pier 56 at the heart of the waterfront. 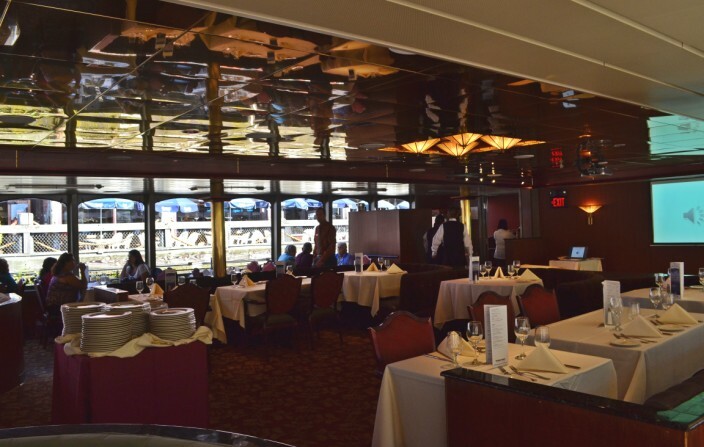 We were soon seated at our second deck window table, the ship slid away from dock and we were underway. 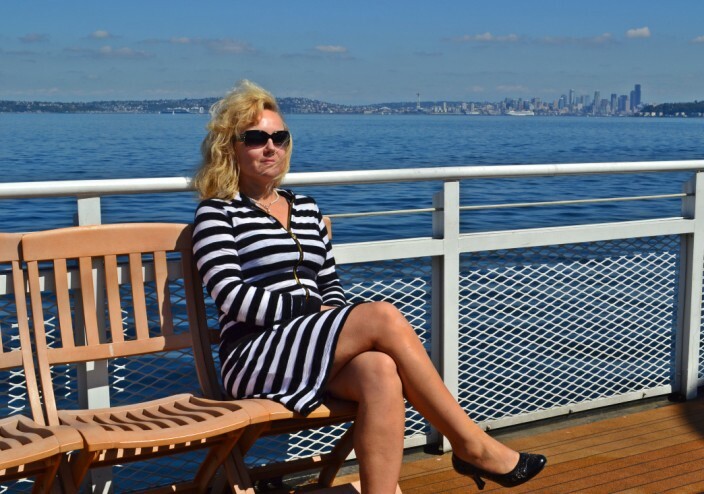 Heading north along the shore, we had a fabulous view of the skyline, a huge docked cruise ship, the Space Needle, and then paralleled Magnolia Bluff for a time before cruising out of Elliot Bay and into Puget Sound. The lunch was billed as a Seattle history tour, and indeed we had a nice young lady standing in front lecturing us almost nonstop for the entire two hours, complete with slide show of vintage photos. Some of it was interesting, informative, and surprising, but after a while everyone kind of wished she would just clam up and let us eat in peace. Part of the problem was they had the sound system cranked way too loud. It’s not ideal trying to have a conversation with your tablemate and needing to lean toward them and shout in order to be heard from three feet away. 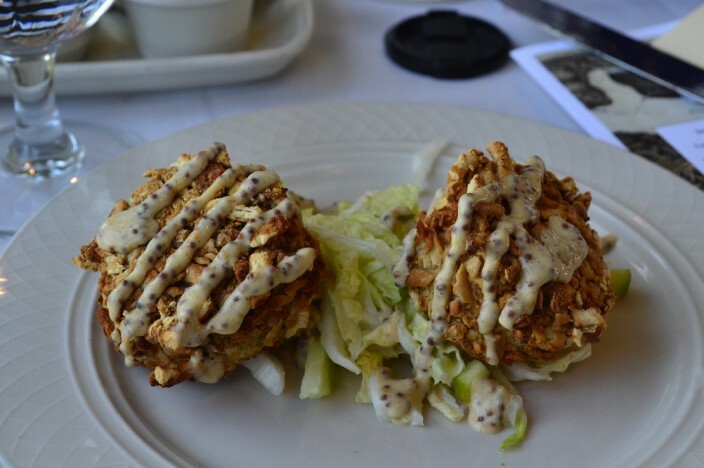 The food was fabulous: fresh salad, chowder, crab cakes, smoked salmon and lots more, and all of it historically accurate in representation of actual dishes served in the Seattle area during the Klondike Gold Rush era, Seattle being the jumping off point for Alaskan prospectors. Stuffed to the gills, we finally escaped the high-decibel history lesson by retreating to the top deck observation level. They piped her yakking up there, too, but it was mostly lost in the breeze and easy to ignore. 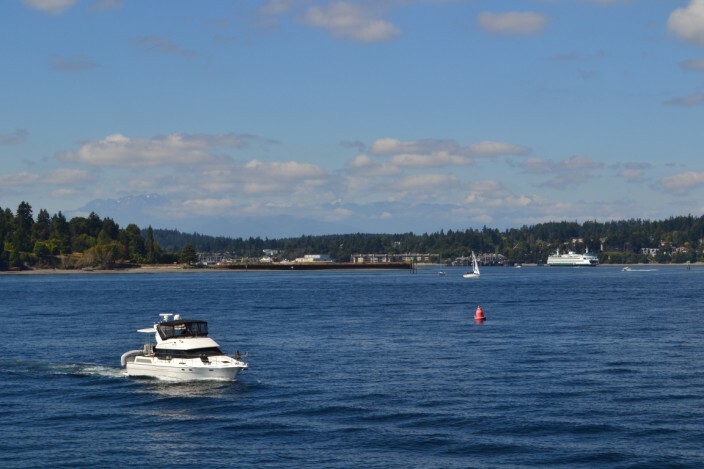 Here we sat on deck chairs and watched the ski boats, humongous ocean-going cargo barges, massive Washington state ferries, and all varieties of water craft plying the waters of Puget Sound, as you might expect on a sunny, end-of-summer Sunday afternoon. Thanks Becky, yeah it’s pretty spectacular in the summer sunshine around here – not quite so much in January I’m afraid! Another place I really want to visit and your photos make it look beautiful. 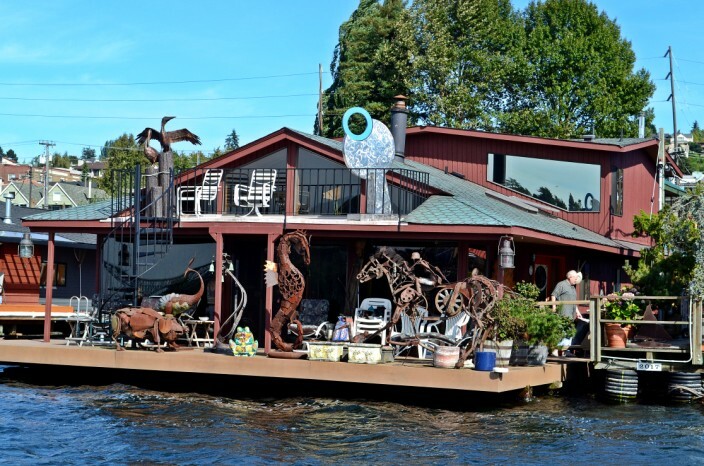 I love the photos of the houseboats what a way to live!